Thread: "How to Succeed with Linux"
1. Decide that it's worth it. 3. Know your package manager. 5. Get a sense of your amazing Desktop choices. 7. Know where to get information. 8. Whatever works is the right way, but there's always a better way. Some people who know me from this forum probably know that for years, it has been my dream to write the PERFECT newbie manual for Linux. Of course, there's no such thing as perfect, but as someone who came to Linux with a background in writing and virtually NO background in computing, I feel that I can supply a needed perspective to the existing literature. Such a manual would be more about the process of learning linux and less about supplying actual information. It would have to be, as there are vast landscapes of knowledge that I do not possess. I know almost nothing about networking, but I have a lot of experience on how to get Linux working with an uncooperative DSL provider who happens to be in bed with Microsoft. For a non-programming Desktop user, that may be the more important information. Anyway, I'm finally getting ready to make a start. Let me summarize the basic ideas that I'm kicking around. Perhaps they will be helpful to someone. Perhaps I can get some help. That's what it's all about. No matter what anyone tells you, for many people, it is easier to fail with Linux than to succeed with it. I know perhaps a half-dozen people who have tried Linux and have given up. For the so-called "everyday user", there are lots of difficulties, and nearly all of them are about SUPPORT. Let's face it, we're all living on Planet Microsoft. Everything most people know about what an operating system is or should be they learned from Microsoft. Now, let me make one thing perfectly clear. Linux fanboys are supposed to hate Microsoft. I used to hate them myself, but when I stopped needing to use their software, that became illogical. I may have some critical things to say, but the bottom line is that they've made a huge contribution toward making the world a better place by lowering the bar of computer literacy to include the masses, and for that they deserve to make a lot of money. No one has the right to control all information technology forever, and there was a time when Microsoft might have accomplished this. But that's all over now. It's never going to happen. As far as I'm concerned, the so-called OS wars were about living in a world where there is a choice, and we do. The War is over, and I believe that Microsoft is adjusting to this reality. As long as they behave competitively, and not anti-competitively, I welcome them and I hope and believe that, in the end they're going to be financially successful. .
Support is why Linux is difficult, and support is bigger than most people realize. Support has to do with the whole culture around us. Support is all the software that you're used to using, all the software your employer uses, and all the knowledge about computing in the world around you. When I learned how to use Windows, I could draw on the knowledge of people all around me: friends, family members, and co-workers. When I learned how to use Linux, I had to turn to the internet, and to try reading about it in a book, usually a big fat book that was written by a programmer. I'd rather pour Drano into my eyes. No one at any computer shop in my area knew anything about Linux, so there was no help there. Support is hardware support. The Linux community has had to support itself with it's own drivers, and that's usually an advantage. I honestly can't recall having a problem with getting any PC Hardware running with Linux, but it took a long time for me to get used to the fact that Linux is almost never mentioned in the operating system "requirements" on the box, and that made investing in the contents of the box feel pretty dicey. Oh, and let's not forget the issue of installation. Most people don't have to install their Windows systems. I can remember a time when the idea of installing an operating system, seemingly taking the life of my system into my own hands, was as daunting as skydiving or scuba diving. Pre-installed Linux exists, but you're not going to find it at Best Buy. Let's not make excuses. None of these problems are the fault of the GNU/Linux technology. If Linux were as ubiquitous as Windows, these problems would go away, but reality is reality, and so it doesn't matter whose fault it it is. The problems are there, they are real and they must be solved, and sometimes they may even have to be tolerated. There are two ways to succeed with Linux. 1. Get supported. Linux geeks will always tell you about their non-geek wives, parents and grandparents who can use Linux out of the box with no problem, and I'm pretty sure that what is happening here is that the geek is providing the support. Marry a Linux Geek, and the atmospheric conditions of a planet where Linux is as common as Windows are automatically replicated. You may not want to go that far. (Or you may be a heterosexual male. Female Linux geeks are pretty rare, somewhere between honest politicians and unicorns.) There's probably a lot of good professional support for Linux out there that I don't know about. Ask around the shops. Linux Haters (they have a website) have a saying: "Linux is only free if your time is worth nothing." Well, that's not the way I would phrase that, but it's absolutely true. Embracing the GNU/Linux lifestyle requires an investment of time that must be paid up front. The good news is that once the price is paid, it's paid... and then, it pays you back. My Linux education took up extra time for about eighteenth months, and has been saving me time, and a whole lot of money, for about six and a half years... and counting! Also, it turned out to be a whole lot of fun. 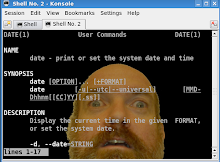 Linux Haters also like to talk about how Linux is for a special kind of person, someone who enjoys computing for its own sake, while a normal person takes no particular joy in computing and simply "uses a computer as a tool." Well, there's a certain truth to that, too. I've been a Windows user, and a Linux user, and Linux users do tend to enjoy computing a lot more than Windows users. Draw your own conclusions. I have become self-supporting, which usually means that I have learned how to take advantage of all the support that is out there (and all the support that is "in there", hidden inside my computer). Eighteen months is longer than it should have taken me, and this article is all about cutting down that time. The person that I am writing this to is me eight years ago. Last edited by blackbelt_jones; 12-14-2010 at 05:02 PM. If you're curious about Linux, and you already have a PC with a CD burner, gratifying your curiosity ought to be easy enough. You only have to download a live CD image, burn the image to a disk, and reboot the machine with the disk in your primary CD drive. The chances are excellent that without any further adjustment to your system, a live CD will allow you to run (a somewhat slower version of) a Linux Desktop OS without any change to the data on your hard drive. The live cd is a great place to start. For something full featured, there's Ubuntu, but for an OS that runs quicker (loads entirely into ram from a live cd) there's Puppy. In general, make a point to emphasize your strong points (without being disingenuous). For example, mentioning that Windows spyware/malware/trojans will do absolutely nothing to a Linux system, is a great selling point (to help average users understand that, I use the analogy of biological viruses. Both dogs and humans are mammals. However, humans can't get kennel cough. Because the biological environment is different). However, falling hopelessly into fanboy land and claiming "Linux is 100&#37; secure!" is disingenuous. I support your effort and if there's anything I can help you with (as a relatively new Linux user myself - compared to others here) let me know. ...all the standard end user behavior. Good luck. Currently running Xubuntu & Blag. Unfortunately I have little time but I'm willing to do what I can to assist - pretty familiar with writing (but my English might need checking) and pretty skilled in networking. * The "Settings" submenu for Firefox is under "Tools" in Win but under "Edit" in Linux version. * The font problem, when ms-corefonts are not installed (or you use other fonts) sharing documents between Lin & Win simply doesn't work properly. I've just begun the first-aid guide, and it's written in Swedish, but I'll translate it and post it - I'll try before X-mas but probably not before New-year. I think I'm going to continue this elsewhere, and link to it here. It will probably NOT be done before Christmas. If you're new, you can help me by letting me know where I'm failing to address my needs. If you're an old hand, you may catch omissions and outright errors. I'd like to know above all what anyone thinks of the ten steps. The live CD is indeed a classic place to start, but these days, we have numerous other options. There's the wubi installer that leats you run Linux as if it were a Windows application, for Ubuntu, and bootable USB flashdrives that are faster than live CDs and retain data. and there are virtual machines that make running any OS within any other OS simple and risk free. If you really know that you want to succeed with Linux, I believe that the preferred option is a practice machine for learning.. My first Linux box cost me 40 dollars, and it was a piece of crap, but it ran Mandrake 8.1 just fine. Nowadays I use old hardware exclusively. Linux runs great on old hardware, and not paying a lot of money for my computers means I can experiment, be reckless and have fun. I bought a new box for 600 dollars, a lot of money for me, and when it kept breaking down, I had to keep putting more money into it. When my 40 dollar computer breaks down, I can just walk away. Having a separate cheap linux computer instead of operating on your main box lowers the stakes, and it allows you to keep the internet available as a resource when things go wrong... and at first, things ALWAYS go wrong. The best place I know to buy a cheap desktop computer is http://propertyroom.com, a police auction site. I bought two computers from them, both Dell Optiplexes, and they have been reliably, one for about a year, and another for about two years. I paid the same price for each of them 38 dollars + 20 dollars shipping. At Property room, they wipe the harddrives, (or sometimes remove them) so you don't get an OS with your computer, and that makes them a great place to go for a Linux box in particular. Started computers too old. When need fix or upgrade have to relearn over and over. And over. Doesn't stick. Have books that are virtually no help: Ubuntu Unleashed 2008; Ubuntu kungfu. They are useless for the simple problems I have - or I'm too simple to apply them to my problems. I need a simple(?) reference that has flowcharts for actions to take if x, etc. ; and computer baby-talk instructions, again, step by step, assuming nothing. Took me months to get my peddle-up modem running in linux, for example, using forums, and will be facing that again w/an immanent upgrade- virtually nothing retained. I've spent over a week on forums trying to get a cd player to load my upgrade, another example. An aside, would have quit Lnx but loathe supporting Gates or Apple. I got smart a couple of years ago and have 2 computers for personal use. I bought an older P4 from a high school upgrade and use it as a spare for when I make changes to my main computer. Things seem to go much better if there is no pressure to get it back up and running right away. Makes sense. Already have but would have to do the 'get a modem to work torture' for it. Will do, evenually, though. If present os dies b4 I can upgrade I'll forum w/Mom's pre-pentium Dell W98... .
Is Larry Webb a penname? A little advice ...if I may. Never upgrade your distro from an existing installation. Always do a fresh install and before installing backup your /home folder with your settings somewhere. Do not upgrade until you have learned the ins and outs of the version you are using. I'm an old man too and I can't commit everything tomemory but I save documentation and knowhow to use Google for what I need. I have been running Linux for over 15 years and the challenge is what it is all about. Ubuntu at one time was a distro I would recommen for people new to Linux....but no more. Since 11.04 I would now recommend Mint 11.....a derivitive of Ubutntu. Network setup can be daunting at first but if you do it enough times.......it's cake. I can remember the first tme I setup a DSL connection when Linux didn't even have any software or configuration to do th at. I used a set up by a well known....at the time BSD afficiando .........usint "tun" and "ppp". Now its out of the box setup. No it is my real name - I believe like JohnT, don't do upgrades. Fresh installs seem to work with a lot less problems. Got that one: Do fresh install of newer vs. upgrade current. JohnT your link regarding asking well is helpful and I needed that. Will poke around Mint, Thank you. Well, hello there! I was wondering what happened to this! Steven Pinker). But, said Kubuntu 10.04 doesn't have wvdial, necessary for the driver, or at least to follow the instructions that come with it. Apparently can't download wvdial to a floppy, I get no error message, but nothing happens. I can download small things. That cd (kubu.. 10.04) was the only one I could find at the time that would mail. I've since found http://www.pctech101.com/linux-cds/linux. The only thing i can think of is to see if they have a regular ubuntu 10.04 and asking on a forum if it installs with wvdial. Aren't you glad you asked? That's the needs of one beginner - and I gather most are not that knowledgeable with dialup. In reference to your comment about proper punctuation and grammar: The comma after "respect" in your message is unnecessary as the word "and" is used in its' stead. Your information concerning file coding was useful. Thank you.